which is made from grated carrots and whole wheat flour and by adding spices. Carrots as raw fruits, juice or in cooked form, are a great choice for your health. 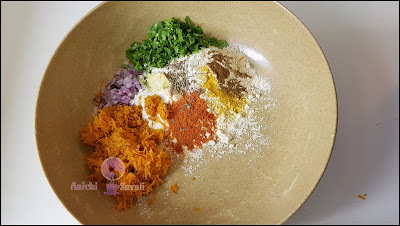 It is flavored with chopped onion, garam masala, and coriander leaves. 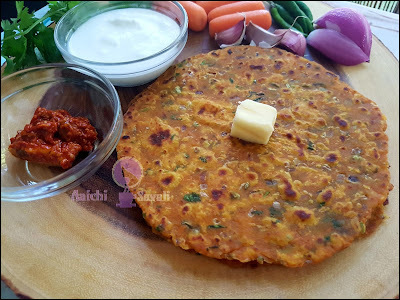 You can pack this paratha for kids tiffin box along with a pickle or with yogurt. 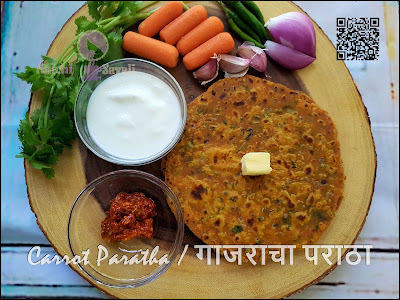 It is surely easy, healthy and kids friendly paratha recipe. Give it a try. Preparation Time : 10 Minutes ; Cooking Time : 10 Minutes. Each serving carries 115 kcal. 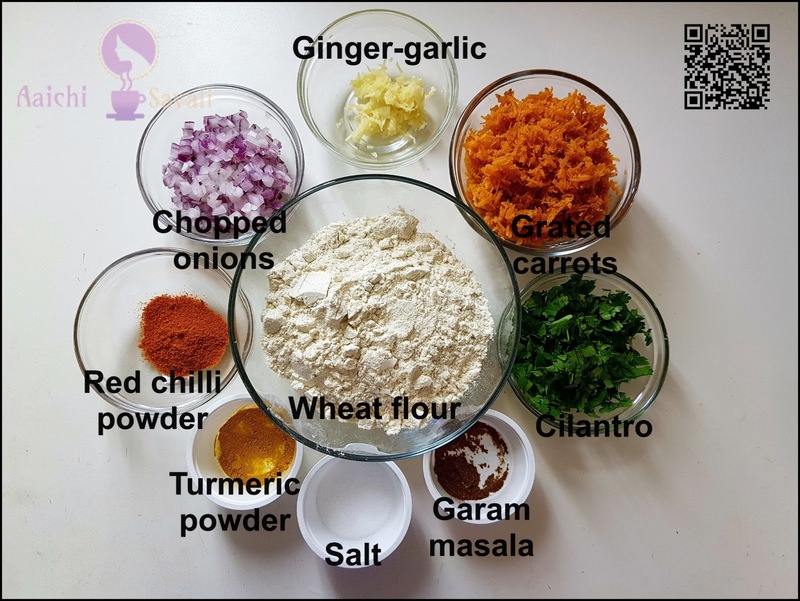 wheat flour, grated carrots, red chilli powder, garam masala, ginger garlic paste, salt, turmeric powder, sesame seeds, chopped onions, coriander leaves and mix all well. Now, knead a soft dough by adding water and take few drops of oil over palms and again knead for 1 minute. and by dusting flour roll each portion into circular shape. Heat the girdle or tava over medium flame and cook the parathas on both sides by applying some oil or ghee each side, cook until golden brown spots appears. Here, tasty and healthy Carrot Paratha is ready to serve. Serve hot with curd, raita or with pickle. Enjoy!!! Per serving contains 115 calories, along with carbohydrates - 18.73 g, dietary fibers - 2.5 g, fats - 3.37 g, proteins - 2.6 g. As it is good source of vitamins and minerals, it contains Vit.A - 72.2 %, Vit.C - 4 %, Iron - 4.1 %. Boost Immunity : Carrots helps our body to fight off foreign viruses, bacteria. Vitamin A and Vitamin D stimulates the production and activity of white blood cells, which play a huge role in defending the body against diseases. Vitamin A also helps regulate the release of immune cells in the gut. Improves vision : Carrots are rich in beta-carotene, which is converted into vitamin A in the liver. Vitamin A is necessary for night vision. Beta-carotene has also been shown to protect against macular degeneration and senile cataracts. Detoxify Body : Vitamin A present in carrots helps the liver in flushing out the toxins from the body. It reduces the bile and fat in the liver. The fiber present in carrots helps clean out the colon and hasten waste movement. Protects teeth and gums : Carrots clean your teeth and mouth. Carrots stimulate gums and trigger a lot of saliva, which, being alkaline, balances out the acid-forming, cavity-forming bacteria. The minerals in carrots prevent tooth damage. Prevent Cancer : Carrots helps to reduce the risk of lung cancer, breast cancer and colon cancer. Heart : Carrots helps to prevents heart disease. Carrots have not only beta-carotene but also alpha-carotene and lutein, which helps to lower risk of heart disease. The regular consumption of carrots also reduces cholesterol levels because the soluble fibers in carrots bind with bile acids. Digestion : Carrots have significant amounts of dietary fiber in those orange roots, and fiber is one of the most important elements in maintaining good digestive health. Fiber adds bulk to stool, which helps it pass smoothly through the digestive tract, and it also stimulates peristaltic motion and the secretion of gastric juices. This also helps to reduce the severity of conditions like constipation. Stroke : Eating a carrot every day reduces the risk of stroke. Carrots have Antiseptic properties and can be used as laxatives, vermicides and as a remedy for liver conditions. Skin : Carrot oil is good for dry skin because it makes the skin softer, smoother and firmer. Carrots as a raw fruits, juice or in cooked form, are great choice for your health. It is good to eat Carrot Paratha for breakfast, lunch as well as for dinner. 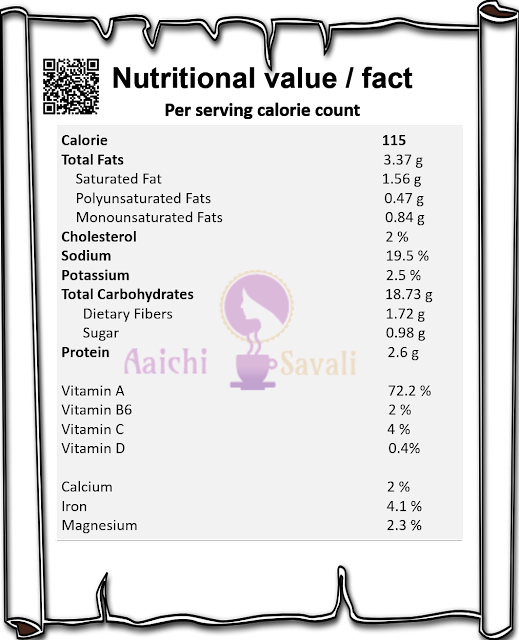 Another wonderful recipe, Aaichi! I love your tutorial, both the video and the photos! Thanks a lot Azlin Bloor, happy to know that you liked carrots paratha.